Tax Structuring - jbabener@taxstructuring.com "The plural of anecdote is not data." - Frank Kotsonis "Truly successful decision making relies on a balance between deliberate and instinctive thinking. "- Malcolm Gladwell A profile of Babener in the NYU School of Law Magazine. An evolving web site featuring analysis and resources on tax-related issues of the day. 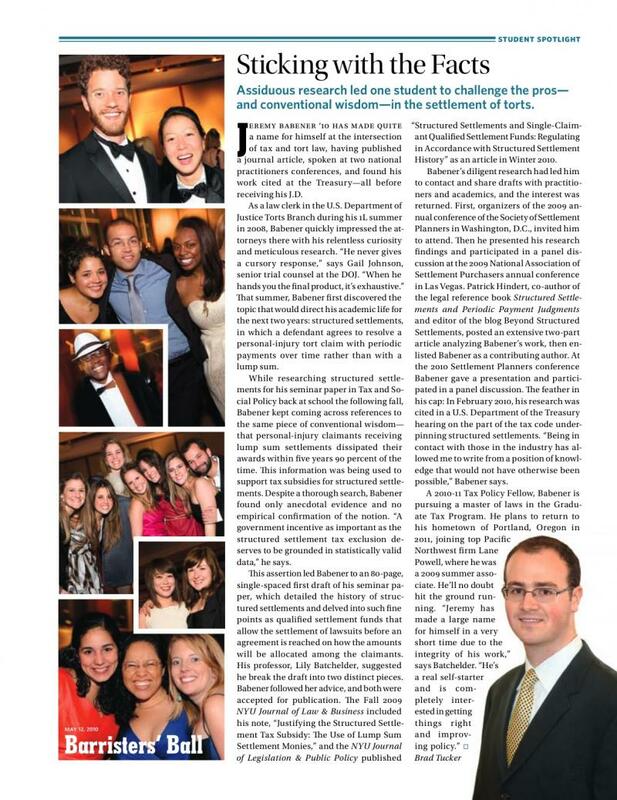 A profile of Babener in the NYU School of Law Magazine. Jeremy Babener is an associate at Lane Powell PC. He has written and spoken about the taxation of personal injury damages, structured settlements, and qualified settlement funds. Settlement Taxation: Planning for Medical Expenses and Death, Annual Meeting & Educational Seminar of the Society of Settlement Planners (Las Vegas, May, 2011). ﻿Panel on Discharge of Indebtedness Deferral Regulations, Meeting of the Passthroughs and Real Estate Committee, D.C. Bar Tax Section (Washington, D.C., September, 2010). Justifying the Structured Settlement Tax Subsidy and Expanding Its Application, Annual Meeting & Educational Seminar of the Society of Settlement Planners (Washington, D.C., May, 2010). Factoring and the Structured Settlement Tax Subsidy, Annual Conference of the National Association of Settlement Purchasers (Las Vegas, 2009). Copyright 2010 Tax Structuring. All rights reserved. This site is intended for general information and resource purposes only. No part of this site may be relied upon as tax advice for the purpose of (i) avoiding tax penalties that may be imposed by the Internal Revenue Code, or (ii) promoting, marketing, or recommending to another person any transaction or matter addressed herein.